This is My Knitted Boyfriend. 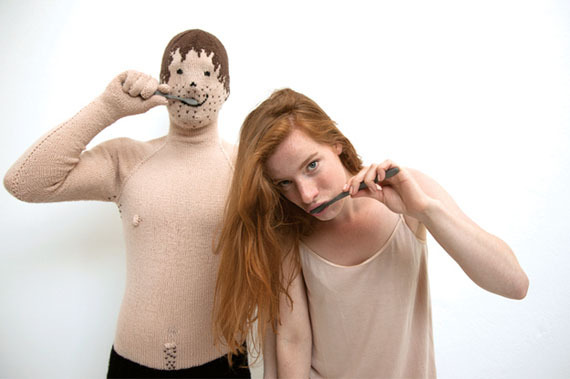 Actually, it’s artist Noortje de Keijzer’s knitted boyfriend. But I’m totally commissioning her to make me one too. That’s right, I’ve finally embraced being forever alone, and boy is it the coldest, loneliest hug there ever was. Just imagine an ugly robot wrapping his robo-arms around you all half-assed like. Except even colder and lonelier than that. I know! It’s sad as hell. Anyway, enough about me, Noortje over here put together this knitted bodysuit because she wanted a man in her life. It can either be worn by an actual man (hey, that’s cheating!) or filled with pillows, stuffing, or in my case: pizza. Hear that Pizza? We can finally be together!